Common Name: Mulberry bark, Morus bark, White mulberry rootbark. Part Used & Method for Pharmaceutical Preparations: The bark of the root is collected in winter. It is cleaned, cut into pieces and dried in the sun. Functions: 1. To reduce heat from the lungs and soothe asthma; 2. To promote urination and reduce edema. 1. Heat in the lungs manifested as cough with excessive sputum and asthma. 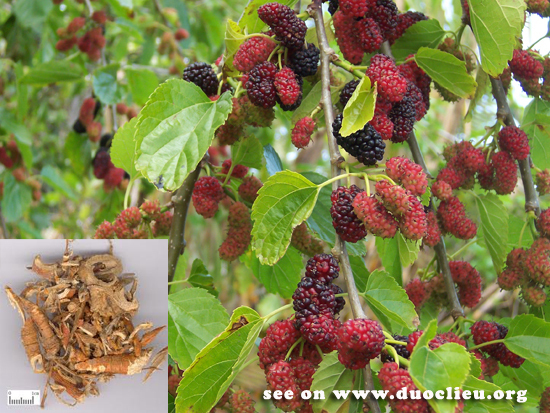 Mulberry bark (Sangbaipi) is used with Wolfberry bark (Digupi) and Licorice root (Gancao) in the formula Xiebai San. 2. For edema, it is used with Pericarpium Arecae (Da Fu Pi), Pericarpium Poria (Fu Ling Pi), and Pericarpium Rhizoma Zingiberis Recens (Sheng Jiang Pi).